I was annoyed when I went to the LibraryThing page for The Last Summer of the Death Warriors and saw that one of the smaller tags (but not the smallest tag) was "romance." Seriously? This is a book about two young men who become friends and learn Really Important Things and struggle to become adults and deal with the hand life has dealt them. And yes, there happens to be a woman in the story, too, and the woman is attractive to both the men, but THIS IS NOT A ROMANCE. Just because a story has some elements of romance (and seriously - they are very few here), that does not make it a romance. Ok, sorry. That just really bothered me. Onto the book! 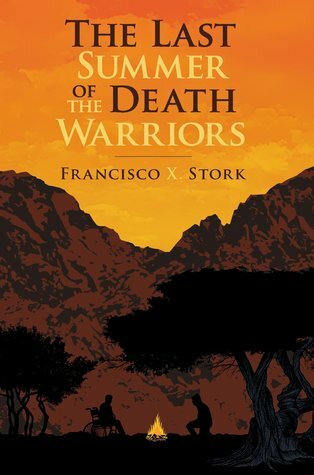 A few years ago, a lot of bloggers read Francisco X. Stork's Marcelo in the Real World and LOVED it, and since then I have had Stork on my radar. Then I read this book by him, and I am so grateful to all you bloggers for introducing me to him because he is worthy of gushing love. Ironic, as his writing style is in zero ways gushy. I really appreciated this lack of gushy-ness. Especially when you consider that the material Stork works with here is really heavy and could easily veer into purple prose. But it doesn't. Instead, we get a very matter-of-fact, honest, and beautiful story about what makes life worth all the effort and heartache. Pancho's mother died when he was five, and his father was killed in a freak accident when he was in high school. Just a few months after that, Pancho's slightly retarded sister, Rosa, also died of "undetermined natural causes." Pancho is convinced the man that Rosa was with killed her. And he wants to find and kill him. But first, he is enrolled in an orphanage, St. Anthony's, where he meets DQ, another teenager who has a very bad case of brain cancer. DQ has passion and intensity, and Pancho finds himself reluctantly drawn into DQ's rules for for living life to the fullest - the Death Warrior Manifesto. And then Pancho starts working at Casa Esperanza, a home for terminally ill patients, and readers have the great fortune to see how Pancho's world view evolves. Let me say right now that this isn't one of those stories in which the hero (Pancho) wants revenge, but then learns to value life and love by interacting with people who have a very limited amount of time left in the world. I said above that this is not a gushy book. There is no sap. Instead, we get two young men struggling to understand their place in the world and how much of it they can control. Two young men who think they know what their goals are and what they want, but then realize that there is just so much more that they never even considered or thought about when coming up with their brilliant manifestos and very specific life plans. It's a book about faith, but it does not define faith narrowly to be believing in God, but uses the word to define belief in yourself and in the possibility of great things happening, in your ability to act in ways that will impact the world around you. There is so much to love about this story. I'll point out a few things. One - this is a book that focuses on two men and one woman who all have very meaningful with each other without dipping into the drama that can come from such a situation. Instead, the three acknowledge what they feel and how it impacts the other two, and how it could complicate the situation, but they don't sit and dwell on it or say horrible things to each other because of it. They all know how important their relationships are and they do not jeopardize them. Two - that it deals with mortality and death from two sides. One man who has lost everyone that mattered most to him, and one man who faces his own death. Both are terrible things to go through, but very different, and the perspective that Pancho and DQ bring each other is amazing. For example, DQ does not get along with his mother, and Pancho is just astonished that anyone lucky enough to have a family member around would waste time not getting along with her. Similarly, DQ is so disappointed by the way Pancho doesn't plan for his future or appreciate all of the things he has now. Three - in a subtle but important way, the book highlights racism and the dangers of putting too much stock in appearances. Pancho himself is a study in acknowledging and defying stereotypes. He grew up in a trailer, isn't great at school, and has some anger management issues. But he has never touched a drop of alcohol, he is great with kids, and he works very hard. Another character, Johnny, is introduced as a man with a long, greasy ponytail and weird, cheap plastic toys that he gives out to people. He believes himself to be a shaman that can help cure people. At first, you are completely turned off by Johnny and think that he's just taking advantage of people thinking he's exotic and "other" to make a quick buck. But then it turns out that Johnny really DOES believe that he can help, and he wants so badly TO help, and he's willing to do a lot for the chance that he will ease another person's pain. I cannot tell you how much I loved this aspect of the book. It was so well done and just so great to read, and even if nothing else appeals to you about the book, you should read it just for this reason. I did this book via audiobook and it was fantastic. Ryan Gessell is the narrator, and he just captured the voice of the characters so well. I liked the voice he gave DQ especially - so scratchy (from what I assume was the impact of the chemotherapy making him weak) and quiet but INTENSE. Usually, my mind can wander a bit during an audiobook, but that didn't happen during this one at all. It was fantastic. This is a totally new author to me. Thanks so much for putting him on my radar! I was one of those who liked Marcelo, so I'll have to try this one. I love his titles, and this one may be the best so far. I would never have picked this up on my own, but it really sounds like something I would enjoy.